Country sensation Brad Paisley will take the stage during his “H20 II: Wetter & Wilder World Tour” to the screams of tens of thousands of adoring fans. But Paisley doesn’t see himself in the same awesome aura as his fans do. The humble singer is probably the only country music lover that doesn’t see his genius on stage or understand the impact he’s made on the genre. Paisley, reigning Country Music Association Entertainer of the Year and Grand Ole Opry member, is a consummate singer, songwriter, guitarist and entertainer. 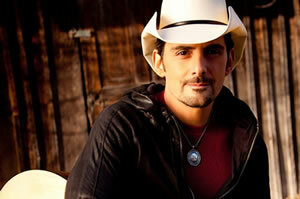 He has won three Grammy Awards, 14 CMA Awards and 13 Academy of Country Music Awards and has racked up 18 No. 1 singles with the last 14 consecutive. In 2010, Paisley’s innovative “H20 World Tour” played to more than 879,000 fans, making it the No. 1 country tour for attendance, according to Pollstar. His current album, “This Is Country Music,” hit store shelves in May and shot to No. 1 on the country sales chart its first two weeks out. Paisley might not have had a career in music had it not been for his grandfather, Warren Jarvis, who gave his 8-year-old grandson a guitar. At first, Paisley was less than enthused by the gift. “The first time I played it, it was like playing calculus,” he told the women of “The View” in May during an appearance. Even though he didn’t understand the meaning of the gift at first, Paisley continued to practice in reverence to his grandfather’s love of the instrument. Paisley stuck with the guitar and by the age of 11 something clicked for him. He now defines himself as a guitar player first and foremost. “That came before the singing or the songwriting,” he says. Before long he was opening for some of Nashville’s best artists, such as Vince Gill and Alabama. Now, Alabama is singing with Paisley on the album “This Is Country Music,” which pays homage to the greats of country. Alabama was an inspiration to Paisley growing up. “They were the first to really bring semi-tractor trailers down the road and have a big production,” he says. It was important to Paisley that the album not only showcase collaborations with the people who are part of country music now but also those who are responsible “for what I love about it.” In addition to Alabama, guests on the album include Carrie Underwood, Don Henley, Blake Shelton, Marty Stuart, Sheryl Crow and Carl Jackson. The guitar track “Eastwood” even features the voice of movie legend Clint Eastwood.